This series picks up around 8 months after Always a Ranger: The past catches up with the Rangers, and threatens everyone’s future. Parts are listed below in order. CHANGING GEARS– Relationships and lives start to fray under the new pressures of an unknown malevolent force. PG-13; Conner/Kira, Tommy/Kim, Hayley/Billy. WHEN YOU’RE LEAST EXPECTING– Two sudden pieces of news put Tommy and Kim's lives into a tailspin, putting everyone in jeopardy as they try to make some hard decisions. PG-13; Conner/Kira, Tommy/Kim, Hayley/Billy. Warning - Character death (non-primary character). CHEAP SEATS– The fight over Kim's status with the team not only complicates her relationship with Tommy, but the team's loyalties as well. And Kim talks some things out with an old friend. PG-13; Conner/Kira, Tommy/Kim, Hayley/Billy. PRESSING THE ADVANTAGE– As Kim sits on the sidelines, the five members of the Dino Thunder team fight Xondar's evil powers. PG-13; Conner/Kira, Tommy/Kim, Hayley/Billy. THE PRICE OF POWER– No matter how safe you think you might be, sometimes bad things happen no matter how careful you are. PG-13; Conner/Kira, Tommy/Kim, Hayley/Billy. Angst Warning. EVEN WITH ALL THIS POWER– When it rains, it usually pours, and for rangers that's the rule, not the exception. PG-13; Conner/Kira, Tommy/Kim, Hayley/Billy. Warning: possibly disturbing subject matter. LOVE MANAGES– The women who love the men in and formerly in the suits talk about matters of the heart before things get irrevocably changed. PG-13; Conner/Kira, Tommy/Kim, Hayley/Billy. ONCE AND FUTURE MENTOR– An old friend once lost returns, bringing the side of good back into the thick of the fight, and perhaps making the difference. PG-13; Conner/Kira, Tommy/Kim, Hayley/Billy. WITHIN THE FIRE OF FEAR– As the team searches for their new power, fears come to light, and choices are made. PG-13; Conner/Kira, Tommy/Kim, Hayley/Billy. FINDING STRENGTH– The team faces their fear as Billy and Hayley prepare for their return to a city under siege. PG-13; Conner/Kira, Tommy/Kim, Hayley/Billy. MAKING IT COUNT– It's time for the new and improved rangers to see about stopping Xondar once and for all. PG-13; Tommy/Kim, Conner/Kira, Hayley/Billy. 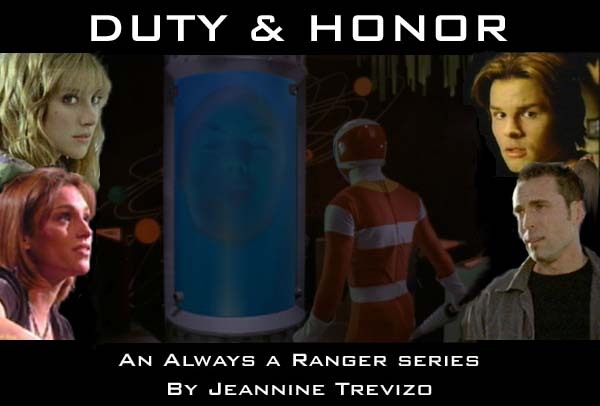 MOVING ON– With Zordon gone along with Xondar, the rangers have to make some decisions... including what to do once school is over. PG-13; Tommy/Kim, Conner/Kira, Hayley/Billy. AND SO IT GOES... THE EPILOGUE– A peek into the future of our favorite rangers, snapshot style... PG-13; Tommy/Kim, Conner/Kira, Hayley/Billy. 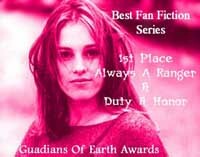 MORE THAN FRIENDS - a Duty & Honor Interlude– The courtship of Kira Ford. PG-13; Conner/Kira, Tommy/Kim. EMPTY HOUSES - a Duty & Honor Interlude– Trent deals with the loss of his father in a world that knows nothing about it. PG-13; Tommy/Kim, Conner/Kira.